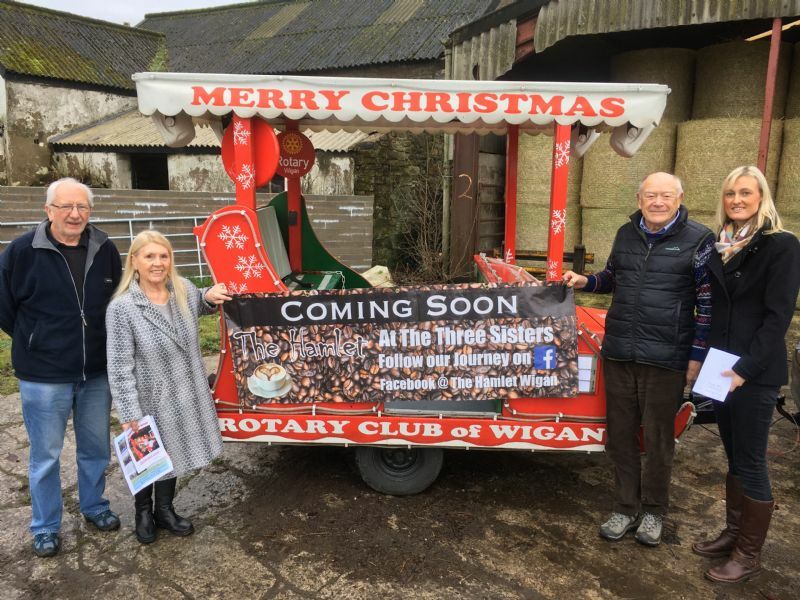 Now that Santa is safely back in Lapland Wigan Rotary Club had to find somewhere to store the sleigh used during his visits to Wigan during December. Thanks to the generosity of Billinge farmer John Alker the sleigh is now safely under cover in one of the barns on his farm. As a thank you the Rotary Club made a donation to The Hamlet café at Three Sisters which is run by his daughter Gemma. The café is staffed by trainees with additional needs, both male and female, between the ages of 18 and 25 and with the help of Gemma are learning all the skills attached to running a café. The Hamlet opened to the public on the 8th January. For anyone interested the café is at WN4 8DD. If you go towards the Three Sisters race track entrance you will see a yellow barrier to the right; go under the barrier and follow the track down to the lake. The cafe is situated in the house near the car park.